Here's a easy chocolate chip cookie recipe; actually I'm giving you some of the best homemade chocolate chip cookie recipes below. I have never met anyone who doesn't love these cookies. 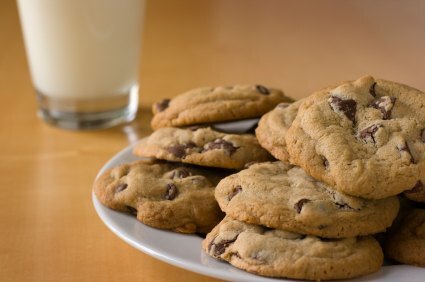 Before you use this easy chocolate chip cookie recipe, please read the tips below. As a common cookie rule, keep the pan at a room temperature between batches so your cookies don't come out flat (melt) with all the butter that is in these recipes. If you can't rotate between pans, run them under cool water to bring the temperature down and dry well before you bake another batch. They are thin and crisp and a bit chewy in the center from just the right mix of sugars - granulated sugar for crispiness and brown sugar for deep caramel flavor. I’ve made these homemade chocolate chip cookies with just about every kind of chocolate known to mankind with satisfying results, but my all-time favorite way is to chop up premium chocolate, not worry about cutting it into uniform sizes or shapes. Having chunks, chips and slivers makes the eating more fun, and I love the way the shapes look when the cookies are baked - streaked, marbled, and totally tempting. Texture tip: If you like them chewy - once the dry ingredients are added to the batter, barely mix the dough (10-15 seconds is plenty). Over mixing will reduce the tender center. Here's a twist on the easy chocolate chip cookie recipe. PREHEAT oven to 375 degrees and take out your cookie sheets. In a bowl, combine the first ingredients and set aside. Beat the butter in a mixing bowl for 30 seconds and add the sugars; beating until completely combined. Then add the eggs and vanilla. Add the flour mixture slowly and beat as much as you can with your mixer. Stir in the rest and mix well. Add the chocolate chips, nuts and grated chocolate. Drop 3 tablespoons of dough at a time on to the cookie sheet and bake for 9-10 minutes, or until the edges are light brown. Cool on cookie sheet for two minutes and carefully transfer to wire racks. This cookie flecked with dark chocolate chopped from whole chocolate bars. The bakers' preferred brands include Dandelion, Guittard, Tcho and Valrhona. This cookie, with its thin, waferlike texture, lasts a bit longer than a chewy version. Keep them in an airtight container. PREHEAT oven to 375 degrees. Adjust racks so they divide the oven into thirds. Line two baking sheets with parchment paper. Whisk together flour, baking soda and salt in a medium bowl. Melt butter in a small saucepan on the stove or in the microwave. Let cool until barely warm to the touch. Transfer butter to a stand mixer fitted with the paddle attachment; add both sugars. Mix on medium speed until well blended, about 30 seconds. Add egg and vanilla and mix until completely combined. Scrape sides of the bowl with a spatula. Add flour mixture and mix on low speed until just combined, scraping the bowl if necessary to incorporate dry ingredients. Add chopped chocolate and nuts (if using); mix on low speed until evenly distributed. The dough should be slightly shiny and loose. Using a small ice cream scoop or tablespoon measure, drop well-rounded balls of dough onto the prepared baking sheets about 2 inches apart. Dampen the palm of your hand and flatten each cookie until about 1/4 inch thick. Bake for about 14 to 16 minutes, rotating baking sheets halfway through the baking time and changing shelves, until cookies are evenly golden. It is important to bake them fully to ensure crispiness throughout. When cool enough to handle, transfer to wire racks (the cookies will get crispier as they cool). Easy chocolate chip cookie recipe adapted from Carey Jones and Robyn Lenzi, authors of the cookbook "Chocolate Chip Cookies" and featured courtesy of InStyle magazine. With just a hunt of coffee flavor, this gooey, chocolatey wonder hails from "The Model Bakery Cookbook" by Karen Mitchell and Sarah Mitchell Hansen. Guittard semisweet chips (kingarthurflour.com) are hands down the top choice for this recipe. Makes 18 large cookies. Easy chocolate chip recipe featured courtesy of InStyle magazine. Sift together flour, baking powder, and salt in a small bowl; set aside. Put chopped chocolate in a large heat proof bowl, preferably stainless steel. Set over a large saucepan of barely simmering water and let stand, stirring occasionally, just until the chocolate is melted and smooth. Add butter and stir until melted and smooth. Remove from heat. Beat sugar and eggs in the bowl of a stand mixer fitted with whisk attachment on high speed until mixture is fluffy, thick and pale yellow; approximately 5 minutes (or by whisk about 8 minutes). Beat in espresso and vanilla. Reduce mixer speed to low. Add melted chocolate and butter mixture. Add flour mixture stopping to scrape the sides of the bowl to ensure that the batter is completely mixed. Stir in the chocolate chips and walnuts. Transfer bowl to the refrigerator to chill until firm enough to shape, about 30 minutes. Divide dough in half. Place an 18x13 inch sheet of parchment paper on a work surface. Drop large spoonfuls of dough across the width of the paper. Using wet hands, pat and shape the dough into two 9-inch even logs. Wrap dough in the parchment paper. Place logs on a baking sheet and refrigerate at least 2 hours or until firm enough to slice. PREHEAT oven to 350 degrees. Position racks in the top third and center of the oven. Line two cookie sheets with parchment paper. Since the logs will be flat where they sat on the baking sheet, roll wrapped dough on the work surface to smooth it so slices will be round. Unwrap the dough. Using a thin, sharp knife dipped in water, cut each log into nine 1-inch thick rounds. Arrange rounds about 3 inches apart on the lined pans, allowing flour per pan. Refrigerate remaining rounds. Bake, switching the position of the pans from top to bottom and front to back halfway through baking, until the tops of cookies are cracked and edges are beginning to crisp, about 20 minutes. Let cool on the pans 5 minutes. Transfer cookies to wire racks. Repeat with remaining dough rounds on a cooled pan. PREHEAT oven to 375 degrees and line two baking sheets with parchment paper or silicone mats. Mix the flour, salt and baking soda together; set aside. Beat the butter on medium for 1 minute or until smooth. Add the sugars and beat for another 2 minutes until well blended. Add the vanilla and eggs, one at a time, beating for 1 minute after each egg goes in. Reduce speed to low and add the dry ingredients in three portions, mixing only until each addition is incorporated. Fold in the chocolate and nuts. At this point, chill the dough for one hour before baking. Or you can refrigerate the dough for up to 3 days or freeze it. If you like, you can freeze rounded tablespoons of dough, ready for baking. Freeze the mounds on a lined baking sheet, then bag them when they’re solid. There’s no need to defrost the dough before baking, just add another minute or two to the baking time. Spoon the dough be slightly rounded tablespoons onto the baking sheets, leaving about two inches between spoonfuls. Sprinkle with sea salt. Bake the cookies - one sheet at a time and rotating the sheet at the midway point for 10-12 minutes or until they are brown at the edges and golden in the center; they may still be a little soft in the middle, and that’s fine. Pull the sheet from the oven and allow cookies to rest for one minute, then carefully, using a wide metal spatula, transfer them to racks to cool to room temperature. Repeat with the remainder of the dough, cooling the baking sheets between batches. Makes 34 medium sized (heaping tablespoon) cookies. Use 1-1/4 cups flour and 3/4 cup unsweetened cocoa powder. Proceed with recipe. Add 1-1/2 tablespoons of instant espresso powder after you add the vanilla extract. Use 1-1/2 sticks (12 tablespoons) of unsalted butter and 1/2 cup peanut butter. You can use chunky or smooth, but it’s best not to use natural peanut butter because it does not give you the right texture. Beat them together before adding the sugars. Use salted peanuts instead of walnuts or pecans. Use 1-1/2 cups flour and 1/2 cup malted milk powder. Proceed with the recipe. Add 1-1/2 cups sweetened shredded coconut, toasted or not, to the dough when you fold in the chocolate chips and nuts. You could also add dried bits of apricots too. As a matter of fact, the following is another one of my easy Chocolate Chip Cookie recipe that produces large, chewy, melt-in-your-mouth cookies. For the cookies to stay chewy, they need to be left on the cookie sheet until completely cooled. Also, the butter MUST be melted, and the flour should be all-purpose. My suggestions to avoid cake-like cookies are: use real butter, be sure to melt the butter, and cool so you don't melt the chocolate chips. Don't over beat your eggs, and do NOT skip the extra egg yolk. The cookie dough should be refrigerated for 1 hour until it is hard, or the cookies will turn out flat. Make sure to cool down the cookie sheet before baking another batch. Fifteen minutes is the perfect time to bake these in my kitchen. The appearance of the PERFECTLY DONE cookie: If the edges are lightly browned, and the middle of the cookie looks slightly undone, they are done perfectly. If you want these cookies to stay moist, put in sealed container after baking. If you want them crunchy, leave them exposed to air. I use a melon baller to get the cookies at a good uniform size; 1 to 2 scoops depending on the size of the melon baller. Also, as every oven is different, my cookies come out perfect at 9 minutes, don't let the soft look fool you. They seem to continue to cook a bit after you take them out. The cookies are done after 12 minutes even though they may not look it. Refrigerate the dough for 1 hour before using. That makes it much easier to handle. These cookies DO NOT spread out at all when they cook, so feel free to put them close together as possible on the cookie sheet - it will save you time if you're making all 7 dozen. Fifteen minutes is the perfect time to bake these. The appearance of the PERFECTLY DONE cookie: If the edges are lightly browned, and the middle of the cookie looks slightly undone, they are done perfectly. If you want these cookies to stay moist, put in sealed container after baking. If you want them crunchy, leave them exposed to air. Easy chocolate chip cookie Recipe and tips adapted from Dorie Greenspan's "Baking, From My Home to Yours." She is wonderful. PREHEAT oven to 350 degrees. You will need an ungreased cookie sheet(s). In a large bowl, cream together the butter, brown sugar, and white sugar. Beat in the instant pudding mix until blended. Stir in the eggs and vanilla. Blend in the flour mixture. Finally, stir in the chocolate chips and nuts. Drop cookies by rounded spoonfuls onto ungreased cookie sheets. Place the cookie dough in the refrigerator between batches. Bake for 10 to 12 minutes in the preheated oven. Edges should be golden brown. This recipe makes a double batch. Receive Updates the Second They Post! The Miss Homemade Recipes from Scratch Blog lets you know whenever any new or updated web pages appear on Miss Homemade. Don't miss new finds, updates and cooking adventures. To subscribe to Miss Homemade's Blog (no e-mail address necessary), RIGHT-click on the orange RSS button and then copy-and-paste the URL of the "RSS feed" into your blog reader. Or click on the Google, My Yahoo!, or My MSN button if you use one of those. Follow their instructions. Become part of the Miss Homemade Blog! Tell your favorite recipes by clicking here! Your story becomes part of this blog for others to read! Enjoy... this is fun! Affiliate Disclosure: I am grateful to be of service and bring you content free of charge. In order to do this, please note that when you click links and purchase items, in most (not all) cases I will receive a referral commission. Your support in purchasing through these links enables me to keep my recipes online and helps people worldwide to blog with less worry and less hassle. Thank you!